After shopping for most of the day, a couple returns to find their car has been stolen. They go to the police station to make a full report. Then, a detective drives them back to the parking lot to see if any evidence can be found at the scene of the crime. To their amazement, the car has been returned. There is an envelope on the windshield with a note of apology and two tickets to a music concert. The note reads, "I apologize for taking your car, but my wife was having a baby and I had to hot-wire your ignition to rush her to the hospital. Here are two tickets for tonight's concert of Garth Brooks, the country-and-western music star." 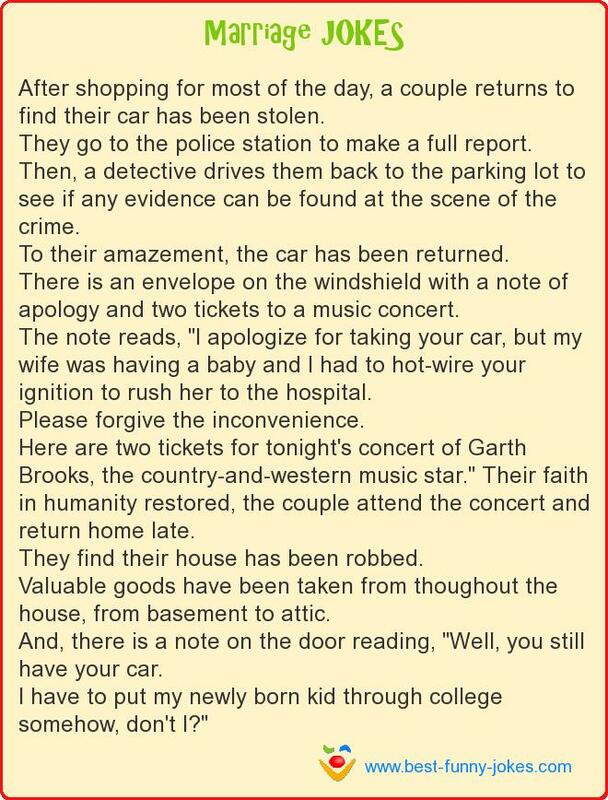 Their faith in humanity restored, the couple attend the concert and return home late. They find their house has been robbed. Valuable goods have been taken from thoughout the house, from basement to attic. And, there is a note on the door reading, "Well, you still have your car. I have to put my newly born kid through college somehow, don't I?"